When you turn to the courts for a solution, be it a custody scenario, personal injury case, nursing home neglect, or the like, the process of going through the trial can be extremely stressful. 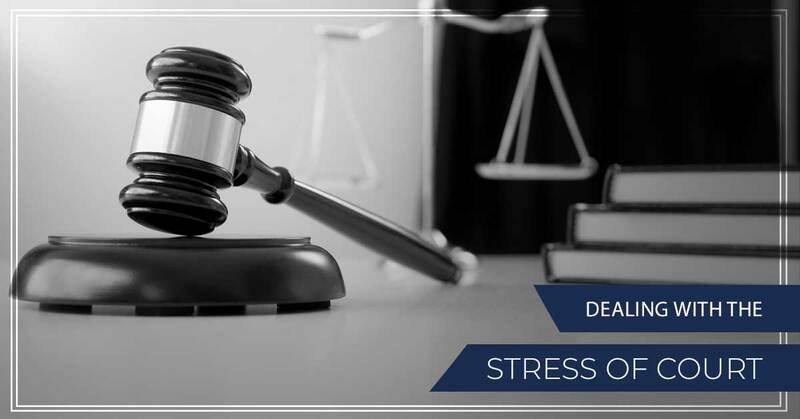 It doesn’t matter if it’s your first time going to court or you’re familiar with the court system, every trial comes with stress and heightened emotions. In today’s blog, we’re going to touch on a few ways that you can manage the stress that you’re dealing with and how to make it even the slightest bit more manageable. A majority of cases that get taken to court are going to take time to come to a resolution, and they can require you and your family to have to jump through hoops and overcome challenges. While a lot of the work that you’re doing is absolutely necessary, it’s vital that you set aside time to relax as well. When it comes to the work that you do need to get done, set certain hours that you’re going to focus on the case and the tasks that need to be completed. By dedicating certain times to concentrate on the case, you can enjoy all of the additional downtime that you’ll have. Doing this is not only great for time management, but it ensures that you’re focusing your thoughts on the case only when you’re working on it. Organization can play a significant factor in stress levels. When there is organization in a scenario, you can almost guarantee that there is going to be less stress. For that reason, we always suggest implementing some type of organization system when you’re heading into a court case. Whether it’s a filing system for the documents, a flash drive that makes it easy for you to access all of the important paperwork that you have, or even something as basic as a schedule to stick to, implementing an organizational strategy can drastically reduce your stress levels. If you’ve been coping with the stress of your court case and haven’t tried organizing it all, give it a shot. You’d be surprised at home much of a difference having things in place can affect your stress. Sometimes one of the best ways to clear your mind of stress is by throwing all of that energy and focus into something else. Hobbies and acts of passion are great ways to spend your time focusing on something else. Whether you like working out, painting, attending shows, or just having some downtime to read or write, dedicating time to these little things are a great way to release yourself of the stress that you’re feeling from the case and focus entirely on something you enjoy. If you’ve figured out a schedule of when you’ll be focusing on tasks that need to be completed for the case, make sure to work in some time where you are releasing any stress that was built up after. For example, if you’ve dedicated two hours of your time to talking to your lawyer and getting tasks in order, make sure that you’ve set at least 30 minutes to decompress and clear your mind. Court can get expensive, and so can everything that comes with it. Though that may be the case, scheduling a getaway to literally leave your worries behind for a bit can be beneficial. It doesn’t have to be something luxurious for it to provide you with some relief from your stress. Something as small as visiting family out of town, driving to the neighboring town, or even visiting a state nearby can help you get out of your routine. While it can be nice to leave your worries behind, you want to make sure that you turn to a getaway when you know that you’re not going to return more stressed out. Make sure to get anything that needs to be done in relation to your court case taken care of so that when you can truly relax while you’re gone and come back to a scenario where you feel in control. One of the best things that you can do for stress levels is to find a professional that you trust with your case. The Edwards Law Firm has years of experience providing individuals in the Tulsa area with the solutions and support that they’re in need of. If you’re looking for a personal injury lawyer, nursing home neglect lawyer, truck driving lawyer, or the like, you can count on our team. Reach out to us today to schedule a consultation with a member of our team. From there, we’ll provide you with some guidance on what to anticipate in the months to come. If you’re ready for a solution, don’t put it off any longer. Let our team do the dirty work for you and assure you that you’re in good hands along the way.